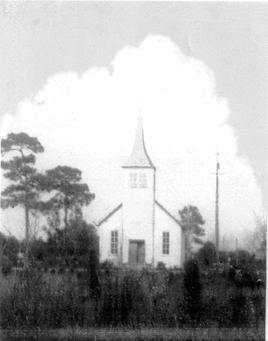 Having been organized about 1840, the First Baptist Church of Wewahitchka, Florida, is one of the oldest in the state. The church was first located in the vicinity of Jehu Cemetery about one mile north of Wewahitchka, which was the site of the first settlement. In 1891, the church building (now newly renovated and used for offices and choir) was moved on logs, drawn by oxen, from Jehu to the present site. Deacons E.Z. Taylor, Dawson Stone, and N.A. Connell were listed as trustees on the original deed. In the early years, itinerant preachers from Blountstown and Apalachicola conducted services monthly. During the early part of this century, some of the pastors who served were Bro. Wright (1906), Bro. Juda (1917), Bro. Bryant (1920), Bro. Bridges (1921), Bro. Wilkes (1930), Bro. Garrett (1935), Bro. Moncrief (1936) and Bro. Hodges (1936). During the World War II years, the church was served by J.A. Nichols. It was during that time that the first parsonage was built. G.T. Hinton succeeded Bro. Nichols in January of 1944. During the ministry of Bro. Hinton, the old sanctuary was relocated on the property and a new sanctuary was built which was dedicated in November of 1952. W.A. Frye was pastor from August 1955, to August 1962. While W.J. Runnels served the church from Sept. 1962, until July 1969, the church built the educational building on the south side of Church Ave. and started the Dalkeith Mission. The present parsonage was built while Charles Johnson was pastor from early 1970 until April 1972. Harvey English was pastor from June 1972 through May 1975, and led the church in a major renovation of the old auditorium. Davis Ramsey was pastor from February 1976 through March 1978. In April 1978, Bro. English was called again and served until October of 1979. In November 1979, Adolph Bedsole was called as interim pastor and served in that capacity until he was called as pastor in March of 1980. Bro. Bedsole led the church in surveying the entire area to locate prospects and instituted a workable visitation program. Also, during that time, the church purchased a new Rodgers organ. In October 1982, Richard Bloodworth assumed the pastorate. In 1987, the church purchased a Yamaha grand piano and completely refurbished the auditorium which included painting, carpet, pew upholstery and drapes. Richard Maddox served as pastor from Dec. 1989 until June 1995. January 1991 gave witness to dedication of the former home of Mrs. Alma Lee Jones, which the church purchased and named the Jones House. It was used for Sunday School, VBS and youth meetings. The home was remodeled in 2006 and is used as a Youth Minister home. In June 1996, the church called Mike Stroud as pastor, and he continues at the present time. Due to the growth of the church and answered prayer, we have added a 16,200 sq. foot Family Life Center that was completed in February of 2007. Then, in 2008-09 the Education Bldg. was remodeled. We also have a bus ministry running on Sundays & Wednesdays. To God Be The Glory for His increase in souls.